Renault Clio Authentique 1.2 3dr Save £2435.00 pre registered 31/05/2005 in Mercury Silver, Odyssey Blue. £5895.00 includes VAT & Delivery. 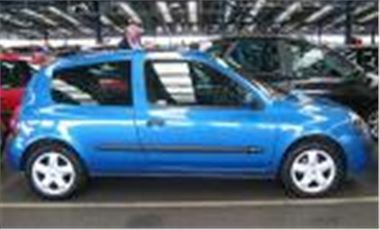 Clio Authentique 1.2 5dr Save £2778.00 pre registered 31/05/2002 and 30/06/2005 Black, Mercury Silver and Odyssey Blue. £6152.00 includes VAT & Delivery.